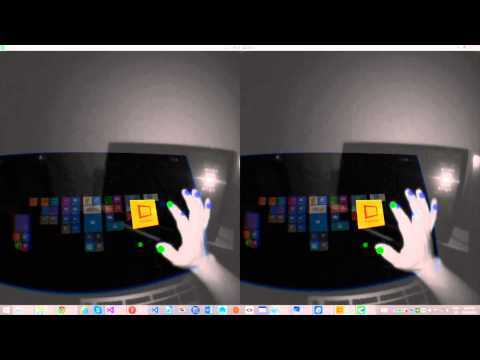 since I now finally made a Youtube-Video, I am proud to showcase "dOculus - VR Touchscreen"
It's a cool demo - I think the subset of folks with both Leap and DK2 and use W8.1 start screen is pretty small though It's a preview of the future though! Thank you guys. Hope I find time for further development. Would love to do so, but need to earn some money in the meantime. Tried to get some funding for further development, but nobody even answers - not at Oculus VR and not at Leap Motion what is quiet frustrating. @antsin3d: it is not just the Win 8.1 start screen, it is a full touchscreen one can use with everything from a browser to the desktop... also the lag is just caused by the screencapturing, normal usage is really instant. Missed this in the Christmas rush, will try tonight looks brilliant. Sorry, took the binarys offline until further development. Had so little useful feedback on this, I decided it needs further development. Would love to add Nimble Sense support to it, but this will sure take some time until Dev-Units are available. It needs some consumer features like Tray-Icons and a InstallShield-Setup, environment Maps seem to be loved. innovative work has got lost in the mix. Good luck with the integration work. Hope it was just that. However, I send you a PM if you need a copy to try... dOculus will be back with an own homepage sometime. Hey thewhiteambit! We emailed you a little while ago, but we haven't heard back. Our team would really like to touch base with you personally Can you shoot me a PM or email [email protected]? dOculus is back! This time as complementary Software for our mOculus Plugin for Autodesk Maya. Touchscreen support was removed, since few people own the combination of Leap Motion and Oculus Rift. Therefore it features an overlay mode now, working together with all windowed Oculus Rift DK2 applications. We have a new Video showing these overlay capability. A combination of mOculus and dOculus allows you not only to work with the Oculus Rift in Autodesk Maya - now you can also work with Autodesk Maya inside the Oculus Rift, enabling live editing capabilitis. Look at the Video demonstrating this "inception mode", and try the new version of dOculus for free with a 100% social discount.